Here is a photo that I shot during my time in Reinfeld. 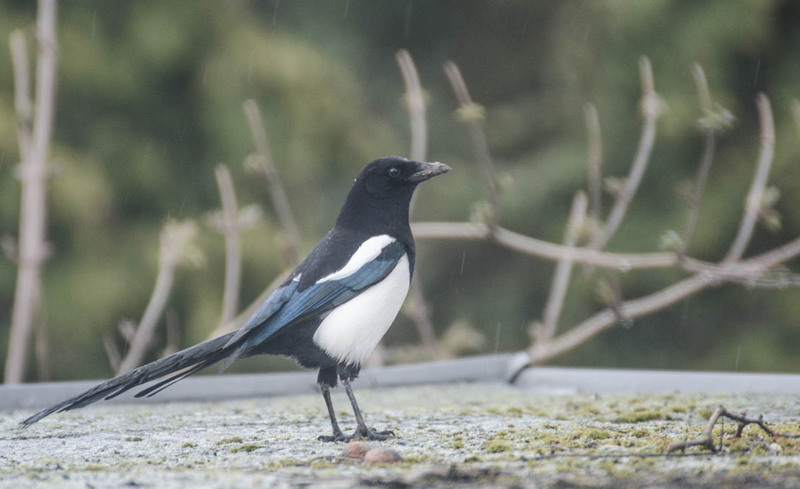 You can see an Eurasian magpie (Pica pica), also known as common magpie according to Wikipedia. I shot the bird through the window glass, as I was standing in the living room. We tricked the bird a little bit, because my uncle and me were aware of the magpie nests on the other street side, and we had this glorious idea to throw some pieces of toast bread on the car port roof. This worked well, because we went back inside and I did set up my camera and around ten minutes later one of the magpies couldn’t resist to get the meal, and I had enough time to take some photos.